About a year ago, the clients and staff collectively wrote letters to send to our US Military Troops. Although many of us have friends and family that have, or currently are serving our country overseas, one of our clients, Axel Rivera, had a family member leave to travel abroad that very same week. His sister, Master Sergeant Marayda Jean- Charles, is a member of US AirForce, and was deployed to Kyrgyzstan. While deployed, she received a heart-felt letter from her little brother, amongst a dozen other letters written by his friends at the Purple Cat, To show her appreciation for our words of support and gratitude, Sergeant Marayda sent us a flag that was flown on the United States Air Force Aircraft while on a mission over Afghanistan along with a Certificate of Authenticity written to “The Purple Cat”, stating the details of when and where the flag was flown. 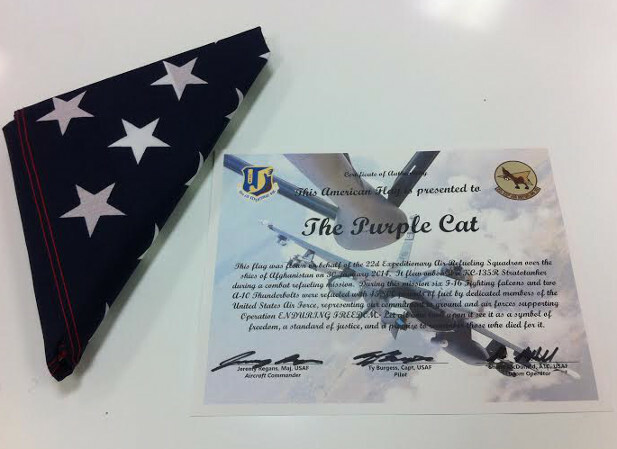 The certificate was signed by the pilots and crew of the aircraft, flown on January 30th, 2013, and the flag was folded in a ceremony held by Air Force Honor Guard Members. Sergeant Marayda also included a personal letter of thanks and appreciation. Words cannot explain how honored we are to receive such an amazing gift from those that risk their lives everyday, fighting for our country. Once framed, they will be displayed at one of our sites to show our endless support for what they stand for.